We all set goals for things we want to accomplish during the new year…okay it’s February so I’m a tad behind, but you get the point. With 2014 still in its baby stages a lot of people are debating where to go, what to do and how crazy to be. Well if you’re looking to plan something for the new year but aren’t quite sure what, I’m here to help! Here is my first countdown post that list my 10 must see places in 2014! For now, I’m sticking inside the U.S. because my must-see list is hugeeeee here. All of the places you are about to see I have either done extensive research on or visited. They are quirky, off the grid and of course absolutely beautiful so sit back and enjoy! If you can look at this picture and say it’s not beautiful than you are either slightly delusion or lying. For those of you who’ve read my earlier posts, you know I was here when I was 8. Even though it was so long ago I absolutely had to add this to the countdown because the image of sitting on this lake and looking at those mountain has never left my mind. Here in the peacefulness of Teton National Park you get all the beautiful mountain views without the massive crowds. It’s also an outdoor enthusiasts dream; I mean there’s everything from hiking to fishing to wildlife scenes. 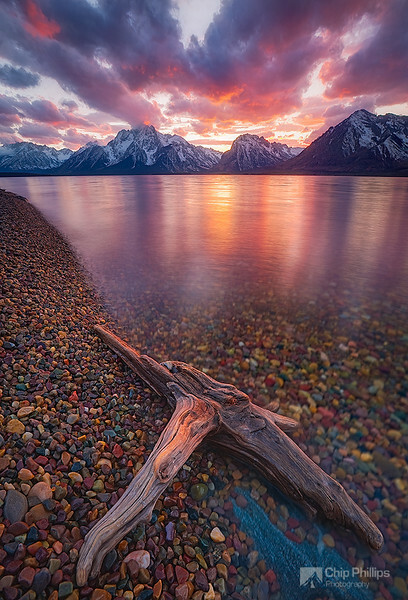 Pictured above is Jackson Lake…god take me back now. The only downside to this trip was that we grounded our aluminum fishing boat/death trap on an island of rocks in the middle of the lake. I’ll tell you that 8 year old Shalee was not a calm child in stressful situations, I’m convinced my shriek started an avalanche somewhere in the mountains. Whoops. This is definitely on my upcoming to-do list. My parents went before my brother and I were born and every time the talk about it, it makes me so angrily jealous. JUST LOOK AT THE PICTURE IT’S BEAUTIFUL. Sometimes I think people forget that the Upper East Coast exists. I mean besides New York City you mainly here about the Rockies, Grand Canyon, Los Angeles and that everything is bigger in Texas. 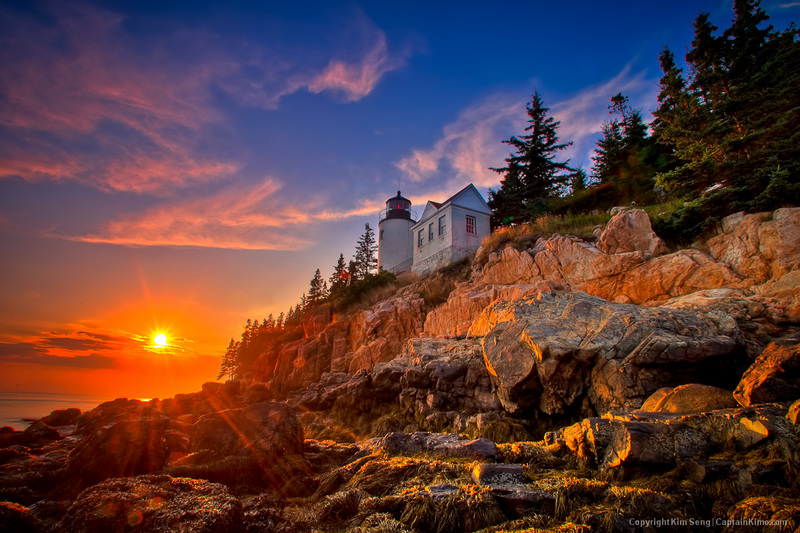 But what about the beautiful less-populated Maine coast? I would kill to live in a place like this. Looks a lot better than a busy freeway. Not only does it have postcard worthy sights but there are plenty of quaint coastal towns nearby, whale watching, and miles of hiking. The thing I loved about researching this park is that I’ve learned it’s perfect for honeymoons, families and road trip vacations. There is a little bit for everyone to enjoy! If your reading this and have been here, just know I secretly hate you. When I visited New Orleans it was less than a month before Hurricane Katrina hit, so the city itself may have changed a bit but I’m sure everything I say remains the same in this city because it was mostly influenced by the amazing people and worldly culture. New Orleans was like a whole new country to me. I was a young teenager and never knew how different America could be culturally until I visited southern Louisiana. The people, the food, the music…it’s all just perfect. The culture is very French influenced and you can definitely tell throughout the city. However it also has its own personal flare of the Louisiana Bayous which consists of beer loving, alligator eating and voodoo loving residents. That being said it’s probably not perfect on Bourbon street with your six year old daughter…naive Shalee had a hard enough time with that place. But outside of the city you can find air boat rides which take you into the Bayous to search for alligators, exciting right?! You even can hold one (not a wild one, of course). You can also see thousand year-old cemeteries that look like a scene right out of a movie and beautiful scenery that you can’t find anywhere else in the U.S. I think there are very few places in Montana that aren’t beautiful. This just happens to be one of the best locations for an outdoor adventurer. One thing that I love about out west is the wildlife, Montana included. Bears, Elk, Moose, Goats, more Bears…you get the point. Not to mention the sprawling landscapes that are perfect for hiking, the rivers that are great for rafting and stunning views that put your mind at peace. All in all there is not too much to be said about Glacier National Park, because I think the views say it all. One thing I need to do is explore this city more. I am in love with Northern California and San Fransisco is the frosting on the cake. The people? Amazing. The coast? Breathtaking. It’s not your typical tall skyscraper, city blocks kind of town. It has it’s own individual character that separates it from all the other cities in the world. One thing loved about the city and the rest of NorCal is how friendly every single person is. I don’t believe I met one bad soul. The bay and surrounding waters are a sports-lovers dream because the area has everything from kite-surfing to body-boarding. Are you a surfer or love the waves? Just a short drive south from the city and you hit Half Moon Bay, famous for the Mavericks–aka the biggest surf waves in the world. Not only do they have the waves, but the town itself is fantastic. Considered a smaller coastal town it has a hometown feel and the coastal landscape is breathtaking. If I ever moved to California, this is exactly where I would be going. Yet another place on my list that includes hiking…shocker. But so many beautiful places aren’t accessible by foot. 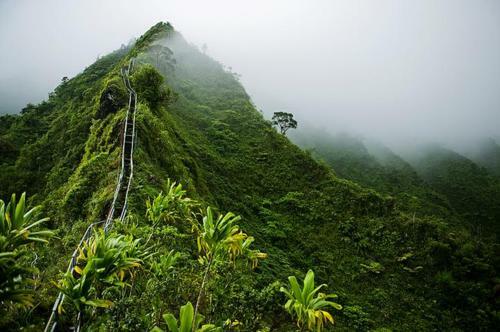 The Haiku Stairs are also known as the “Stairway to Heaven” and give chilling and breathtaking views of Hawaii from above. Although the trail is officially closed, it does not stop adventurous souls from climbing through the overgrown trail to get the best view on the island. Warning: the stairs are extremely steep and this is not a flat-line hike but it’s not gruesomely long either, about two miles. This is the perfect place to see Hawaii without the crowds of tourists and off the beaten path. So who wants to book me a flight to Hawaii? Oh lawd, I love this place. Besides the fact that it is extremely busy in the main valley, the off track paths exploring the Sierra Nevada’s is a must. Yosemite it known for hosting the largest waterfall in the U.S. and for the famous Half Dome which can be hiked for the daring adventurers. The Valley is absolutely beautiful with numerous walking paths, rivers, waterfalls, pools, restaurants, Sequoia trees, landscapes and anything else you can imagine. 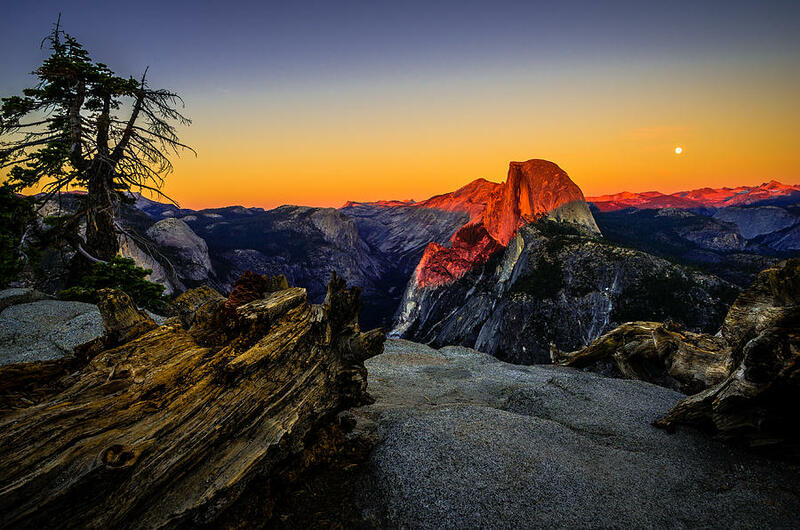 Must sees in the area include: Glacier Point (accessible by car), Yosemite Falls (Small Hike), Nevada Falls (Medium Hike), Sequoia Forests (Small Hike) and of course the Half Dome (Major hike). If hiking 18 miles in one day doesn’t grab you there are plenty of awesome Half Dome Views from around the Valley or you could head out to see some of the biggest trees in the world in the southern portion of the park. Yosemite is also home to El Capitan, which is every rock climbers dream. This is the perfect spot for families and extreme adventurers alike to come together and experience one of the most magnificent places in the world. If you’re looking to get away from reality to a place with no cell service, no crowds and no stress…here is your answer. Beaver Island is a small island located in the middle of Lake Michigan. Accessible only by plane or boat it is a perfect getaway for someone looking for peace and quiet. On the island, there are about 400 year-round residents and even in the peak of summer crowds aren’t overwhelming. Beautiful beaches, crystal clear water, friendly people and two lighthouses on the 30-mile long island are some of the perks to visiting. One of my favorite things? The peacefulness. You can easily escape town and hear nothing but the waves crashing on the shore. In town you can find cute shops and restaurants along with parks, one grocery store, a hardware, post office and the coolest toy museum in the world (it’s also a toy store!). When visiting make sure you master the “Beaver Island Wave” and wave to every other friendly motorist you see on the road, if they don’t wave back it just means they’re new here. 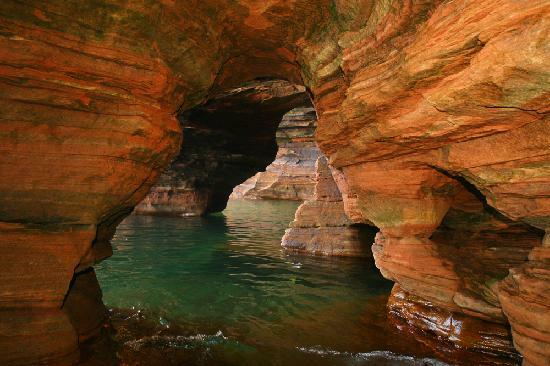 My #1 must-see place in 2014 is the Apostle Islands in Wisconsin! I will be going here this summer and I can’t wait to kayak through the underwater sea caves and jump into the refreshing Lake Superior. Also, these islands can be explored in the winter when the ice freezes enough (and it definitely has this year). When this happens you can walk two miles out to the islands and explore the spectacular ice caves. Again this is a place with very few large crowds and it has a Northern-America feel of small towns and simple lifestyles. Most people are completely unaware that sea caves even exist on the Great Lakes. I’m sure I will be crazy blogging after I explore here this summer, ever since I discovered these islands last fall I have been dying to jump in my car and go. Anyone plan on visiting here this summer? Let me know and maybe we will cross paths! So that’s it! My 10 must-see U.S. places in 2014! I hope you enjoyed reading as much as I enjoyed sharing. My goal here is to inspire the travel-soul in you so if I succeeded–start planning and let me know where you are going this summer! I would love to get some inspiration from all of you as well. Happy travels and an adventure toast to 2014! What did you think? Have you been to any of these places? What are your favorite places in America? Shalee What a list. I hope you see all of them…especially the one we the one where I first met you. I also should Tell you that I was born in Wyoming, but moved when I was three and have no memories. However my parents had pictures that where great. Hope to see you this summer.